Over the years of collecting cookbooks I have built up quite a collection stretching back to 1720s, including some rare first editions and survivors of time and use. The majority of my collection though is from three eras – the Victorian/ Edwardian, 50-80s and the 00s – each saw booms in cookbook publications due to social changes impacting the way we ate and the ingredients available. Unsurprisingly, one could say there are a lot of questionable dishes in them. You look at the books from the 50s to 80s and it’s often one awful looking dish after another. Frankly many of them are crimes against food. You’re left questioning the sanity of people that came up with the recipes. The only good thing they have going for them is that they’ve been left to be forgotten by history. Over the years of going through the books there really are some stand out culinary disasters that stick with you, which are ripe for sharing with the world. (Why should I suffer alone with this knowledge?) 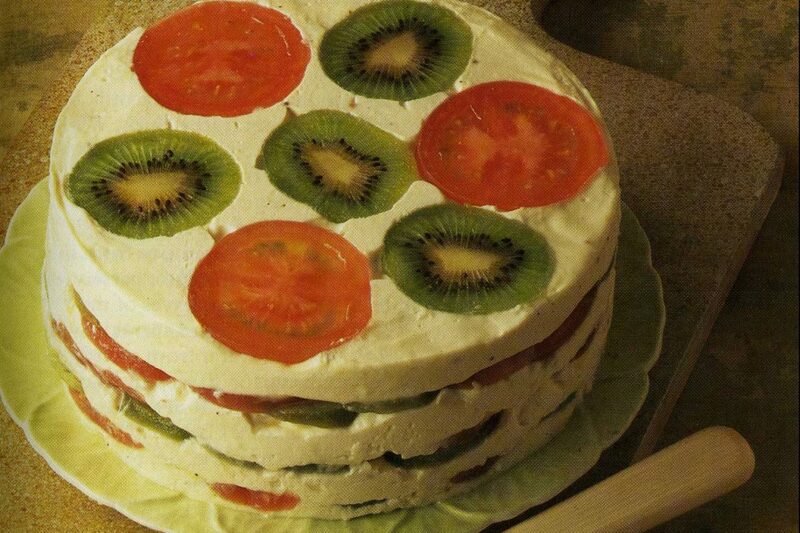 The one that has stuck with me most of all is The Tomato and Kiwifruit Layer Cheesecake, a creation we have to thank Sainsbury’s and the then highly popular cookery writer Josceline Dimbelby (then wife of David and mother of Henry the founder of Leon) for. The Sainsbury Cookbook in question is the 1984 First Impressions: Delicious recipes to start the meal. Many supermarkets and food producers released cookbooks in the past 100 years or so as a way to boost sales and advertise. As the title suggests it’s a recipe book for starters, all with an eye to being the starter of a dinner party you host. 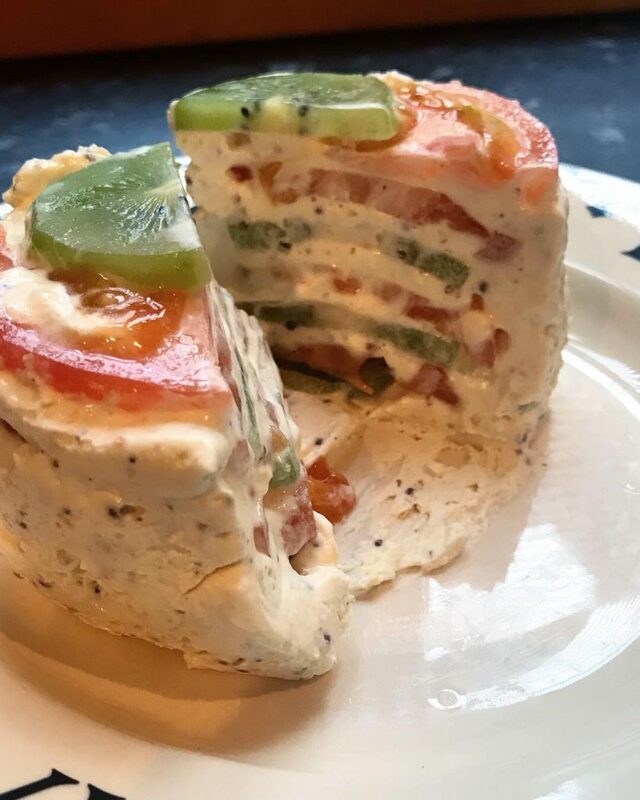 The Tomato and Kiwifruit Layer Cheesecake is a stacked layered tower of sweet and savoury watery fruits and set curd cheese (similar to cream cheese and cottage cheese) with mustard and vinegar in it and set with gelatine. 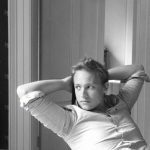 Or as Dimbelby says ‘a savoury cheesecake seems… surprising… [it’s] light-textured, rich and succulent’ with a ‘shining combination or red, green and white’ that’s easy to make and best served with crunch bread of brown toast. Yum Yum Yum! But I’m sorry I can’t see anything appealing about it! That said, I am intrigued at how this could be enjoyable – surly it must have been to have been worth publishing. Lets face it half the dishes of the 80s people would never eat now being often, seemingly, unholy combinations like this one. So I decided to test the recipe, though adjusted for one rather than 6-8 people (I didn’t want to be left with a huge tower that I would have to just bin). I had most the ingredient in the house so only had to get gelatine, a kiwi and a tomato, and I substituted the curd cheese for half a tub of cream cheese left in the fridge – this seemed a fair substitution. The other ingredients needed were olive oil, white wine vinegar, whole grain mustard, double cream, water, salt and pepper. 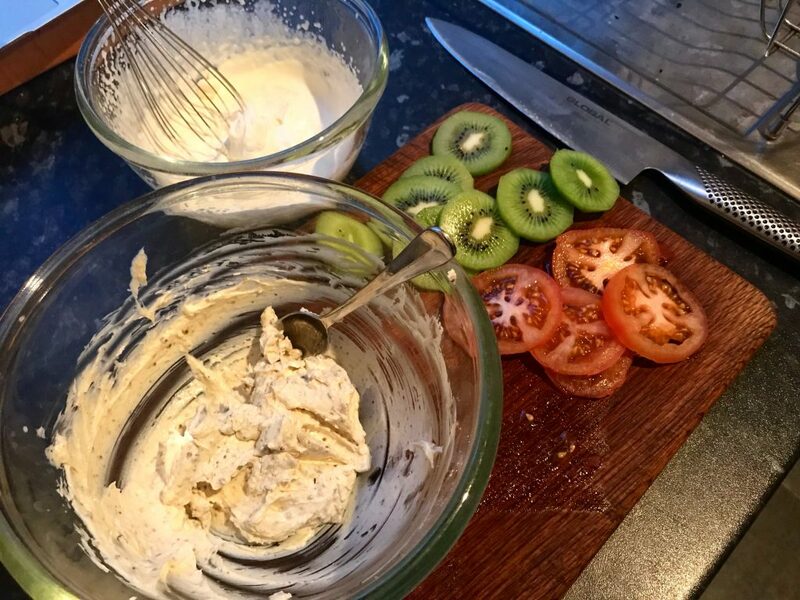 After peeling and slicing both the kiwi and the tomato, I combined the cream cheese, mustard, vinegar and seasoning and then separately whisked the cream, added gelatine and then combined it with the cream cheese mix. This was followed by the procedure of layering the stack before leaving it to set for a few hours in the fridge. Coming to taste it was an interesting experience that required a lot of banging and a knife despite oiling the inside of the pot beforehand. It plopped, in slow motion, onto the plate and thankfully managed to stand, though with a definite bulge in the middle. 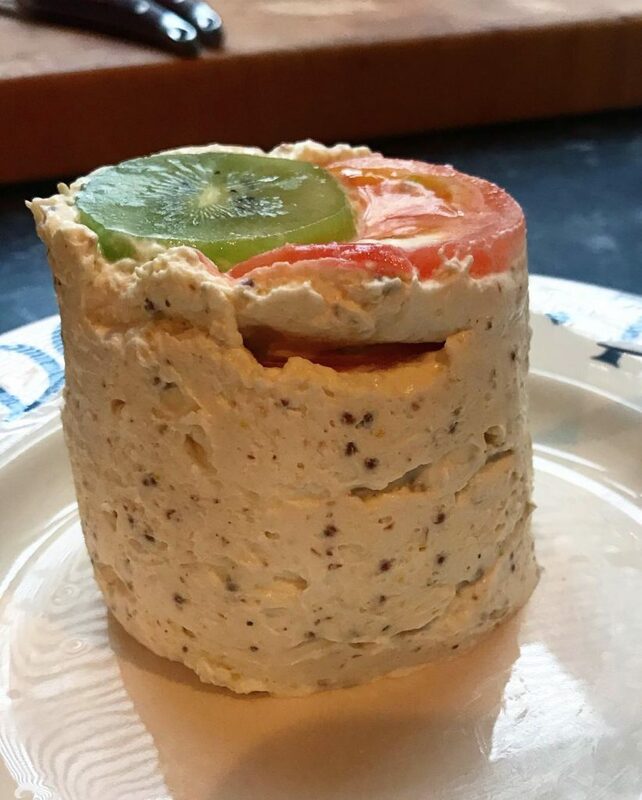 Cutting into it, the inside was a wet creamy gloopy mess, even if the layers were visible, as the water from the tomato and kiwi slices just leached out into the cream cheese. But what about the taste? Well to be honest it was no where near as bad as I had been expecting; but then again I was expecting it to be vile. Instead the taste was really just of mustardy cream cheese with a piquant hint of vinegar at the end. The tomato and the kiwi gave no flavour at all, just a slight texture. I must admit after the first mouthful I didn’t want to continue. I was left with something of a lingering taste that I could have done without; it left me a bit queasy for a while, though that’s probably more due to me eating it on an empty stomach for breakfast. Would I like it as a starter or a meal? No, I’m afraid it’s claggy, more show than substance and has a taste that is very dated and only to be found these days in pubs in the middle of nowhere that time forgot. There are far better ways of combining some of these things – think goats curd, walnuts and beetroots (a lovely combination). In fact, the taste of the left over kiwi and tomato with a little of the cheese mix when making it, was far nicer as the ratio of cheese to fruit was reversed from the final dish. So is it a food crime? Well I wouldn’t go so far as to say that, it wasn’t so horrendous to have noting redeeming or of culinary interest, but still it’s a dish that won’t be missed.